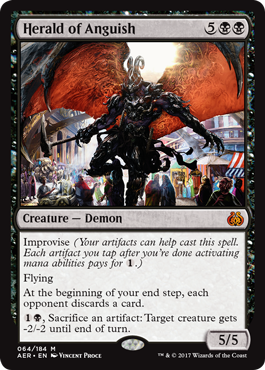 Overall Thoughts: A 1/1 with Deathtouch is always a nice deterrent for your opponent to attack, but costing 2 mana is a little much for this. The 2 energy you get when it enters the battlefield is nice and so is the fact that it can create a Servo token, but it’s not nice enough for this to see much play. Overall Thoughts: Menace is a nice ability, but it’s not used much in Standard decks. Especially not on otherwise vanilla creatures. 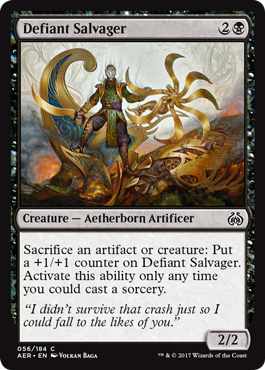 Being an Aetherborn is the only saving grace for this creature, as I think there’s just enough support to make a fairly decent Aetherborn tribal deck. 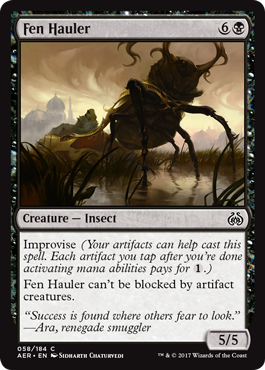 Overall Thoughts: The fact that this has the possibility to kill any creature, regardless of the toughness of the creature, is one of the only good things going for this card. It would be better if it were an Instant (but what Sorcery wouldn’t? 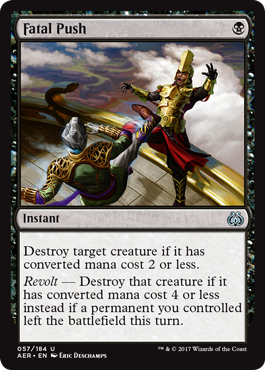 ), but that would also potentially activate the Revolt abilities on your opponents cards, so that could be why so much of our removal now is Sorcery speed. 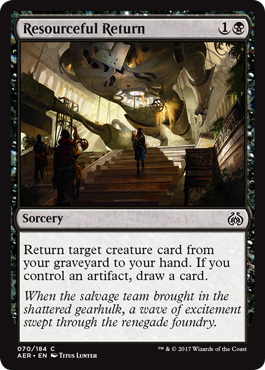 Overall Thoughts: This is a decent piece of removal, but it’s a little expensive. 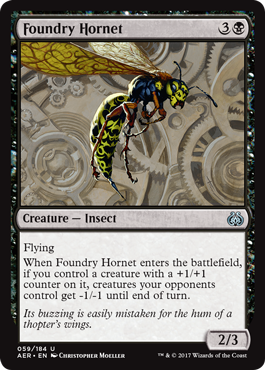 The fact that it only affects 1 creature and only gives a -2/-2 makes this limiting, but the Scry 1 ability is a nice little addition. 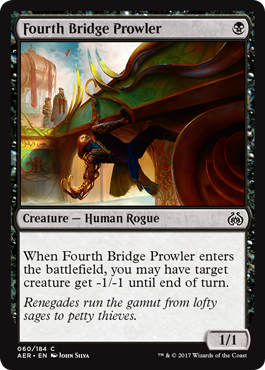 This is a good way to kill off that 5/5 that blocked your 3/3, but it won’t be too impressive most of the time. Overall Thoughts: While still overpriced, this removal is pretty decent. 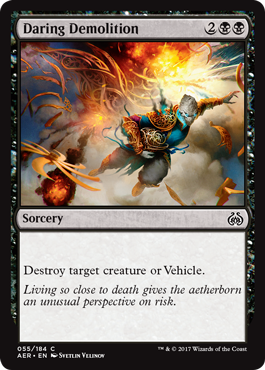 It can destroy any creature, regardless of its size, and it’s nice that it can destroy a Vehicle on your turn, without having been previously crewed. Overall Thoughts: I will never expect to see this in a Standard deck. First of all, a 2/2 is a little small for 3 mana. Secondly, this is pretty vulnerable to removal since you can only pump it up on your turn and at the expense of the rest of your board. For me, this card is summed up in one word, Yuck. Overall Thoughts: This card was very hyped when it was spoiled, and for good reason. 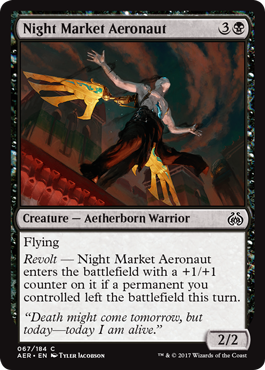 They hit the 3 metrics that make a great card: cheap cost (1 mana), Instant, and modular (thanks to Revolt). This is going to be an all-star in multiple formats. Overall Thoughts: While this card is a little expensive, the fact that it has Improvise gives it that little nudge over to being a playable card. I think it’s relevant that this can’t be blocked by artifact creatures since there are Gearhulks prominent in the format, and it means it won’t get chump blocked by a Servo token. 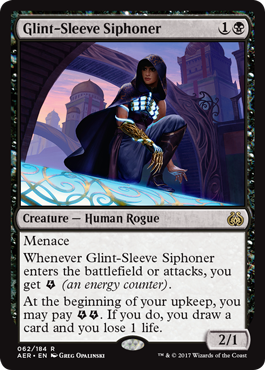 Overall Thoughts: A 2/3 flyer for 4 mana is a bit expensive, but I think it’s totally possible that you’ll be able to give the -1/-1 to your opponents creatures. That can be helpful in making it difficult for your opponent to know whether or not to block during combat. Overall Thoughts: A 1/1 for 1 mana is usually a tough sell in Standard unless it has a decent ability of some sort. Unfortunately for this card, the ability it has is far too narrow to be reliable. 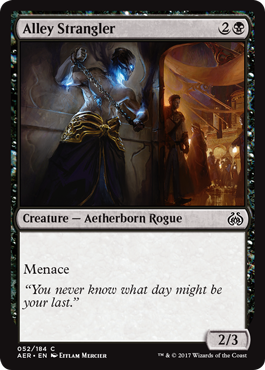 Overall Thoughts: I really like this card, and it’ll fit well into either an Aetherborn or Vampire tribal deck. It’s pretty color intensive, so it can’t just go into any deck, but this is a great blocker. Overall Thoughts: This card is a pretty good way to gain some energy, but it gets outclassed pretty quickly, even with it having Menace. It’s still good to have in play for the ability to draw an additional card during your upkeep if you have other ways to get energy. Overall Thoughts: Getting energy just for losing life is okay. 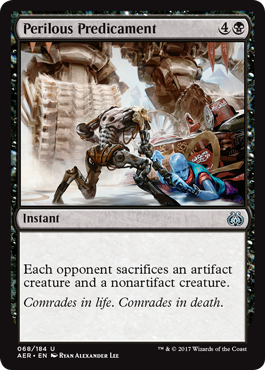 What’s nice about this card is that you only need to lose life on two turns before you can drain your opponent for 3 points. If you can find a way to return this to the battlefield a few times, you’ve got a good engine started. Overall Thoughts: The design on this card is nice. 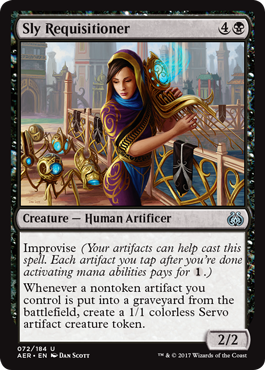 You play a few artifacts that you can use to help cast this due to its Improvise ability, and then later on you can sacrifice those same artifacts to act as removal for your opponents creatures. 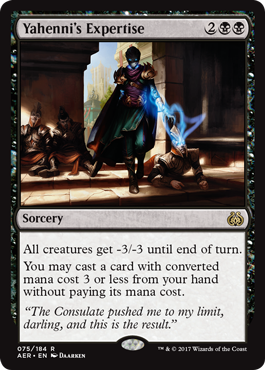 The fact that it’s a 5/5 flyer that makes your opponent discard a card each turn is also nice, even if they get to choose what to discard. I’m hoping to get one of these in my pre-release pool. Overall Thoughts: Don’t let the 3 1/2 rating fool you, this card only gets that rating if you have the artifact to sacrifice to gain the 2 +1/+1 counters when it enters the battlefield. Otherwise, I’d say it’s about a 3. 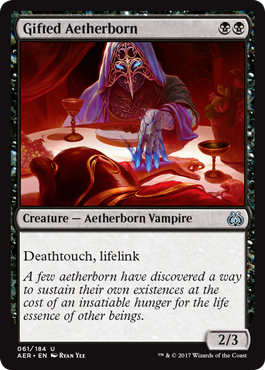 The nice part about this is that it should be good in an Aetherborn tribal deck. 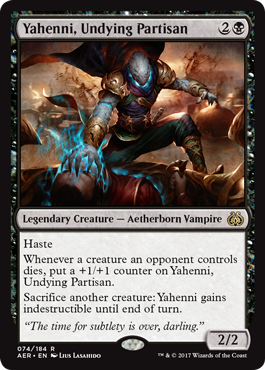 Overall Thoughts: Speaking of an Aetherborn tribal deck, that’s the place that this guy shines. 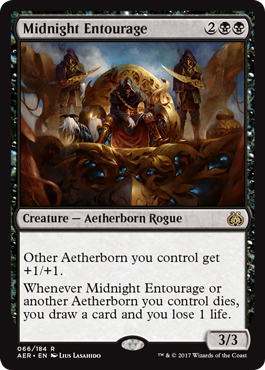 The only thing to look out for is that the card draw & life loss is not an optional ability, so you have to be careful not to let your Aetherborn dying kill you by accident. Overall Thoughts: Here’s another card that really needs to trigger the Revolt ability in order to get the rating I’ve given it. Without it, a 2/2 flyer for 4 mana is way overpriced. With the +1/+1 counter, it becomes a 3/3 which is decent. Overall Thoughts: This card has a lot of potential, having the ability to remove 2 of your opponents creatures. 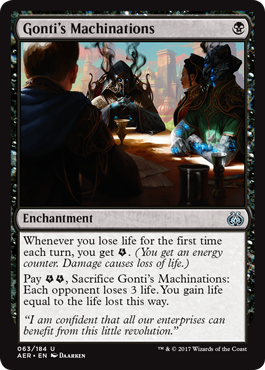 However this card allows your opponent to sacrifice their choice of creatures, so they’ll always choose the ones that affect them the least. Still, I’m hopeful to see this played the turn you blink your Cataclysmic Gearhulk. 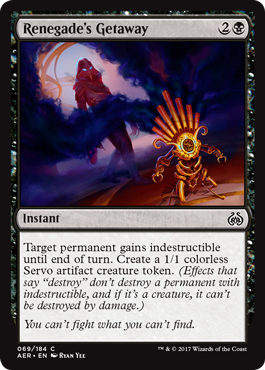 Overall Thoughts: Sure, it’s protection against removal and it also creates a Servo token, but I still don’t think it’ll see any Standard play. I’d leave this out of my deck and put in another 3 mana creature to play instead. Overall Thoughts: It’s nice that this card only costs 2 mana, as you can possibly play the creature you returned to your hand from your graveyard on that same turn. It also seems pretty easy to draw a card with this. This will likely see some play, but it won’t be in every deck. Overall Thoughts: When this card works, it has the potential to be amazing. However the card costs too much to make playing it worthwhile. And it’s not just the mana it costs to cast that’s the issue. You also have to have a card in your graveyard that you want to exile. Then, you’ll probably have to wait until the next turn in order to get any use out of the cards you get. It’s just too slow and too expensive to be played. Overall Thoughts: This is another card that’s just too expensive for it to see any play. Possibly in the right deck, you’ll be able to create an army of Servos, but it’s not very likely to happen. And playing a 2/2 for 5 mana (even if it’s reduced due to Improvise) isn’t something that I’m excited to do. 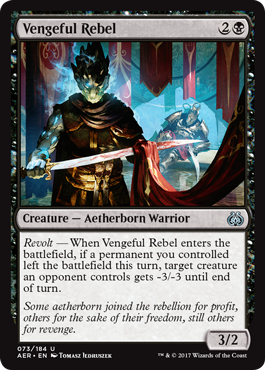 Overall Thoughts: From what I’ve seen, triggering Revolt doesn’t seem too hard to do. 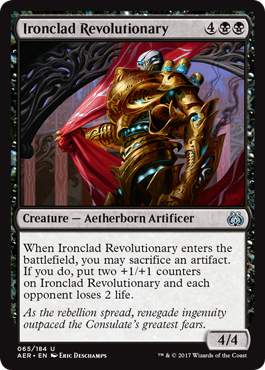 This card is great when you trigger the Revolt ability, as it’s a decently costed creature that also acts as removal. Overall Thoughts: A 2/2 with Haste for 3 mana is not bad. Gaining +1/+1 counters for destroying your opponent’s creatures is good. Having the possibility to become indestructible is also nice. I love that this card curves nicely with Kalitas, Traitor of Ghet and the two cards play nicely together. Looks like fun. 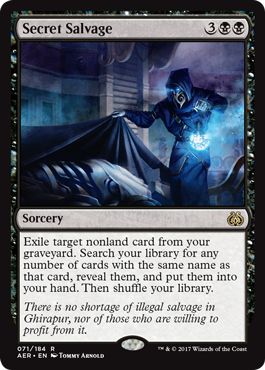 Overall Thoughts: This card is an awesome piece of removal to play, but use caution as it affects both players creatures. The ability to play a 3 mama or less costing card from your hand is pure gravy. This card is going to get a lot of play in Standard. And with that, my review of Black cards is done. What do you think? Are my evaluations on point, or do you believe otherwise? Let me know in the comments below. And be sure to join me again tomorrow when I review the Red cards from Aether Revolt. I’ll see you then.